I immigrated to America with my parents when I was a child. This country has since given me the opportunity to work hard, raise my family, and serve my country both in the military and in Congress. It is important that we have a fair immigration system that works. Unfortunately, our current system is deeply flawed, and I am concerned that the Trump Administration's actions on immigration only serve to create fear and uncertainty in our immigrant communities. The Deferred Action for Childhood Arrivals (DACA) program has given nearly 800,000 young people a shot at the American Dream, allowing them to come forward, live, work, and learn in the United States legally and without fear of deportation. This includes the over 9,000 students, entrepreneurs, and military members eligible for the program on the Central Coast. The President's decision to terminate DACA and strip these young people of that hope and opportunity is unconscionable and incompatible with our American values. Ending this program undermines our economic growth and competitiveness, costing our economy $490 billion in lost GDP over the next decade in addition to losing potential innovation and entrepreneurship. I am proud to co-sponsor the DREAM Act, to permanently codify DACA. In 2018, Attorney General Jeff Sessions announced that the Trump Administration will separate parents from children who try to enter the United States seeking asylum or refuge. I saw the impact of this cruel decision first-hand when I toured the Tornillo detention facility for immigrant children near the El Paso port of entry in Texas. The Administration has since reversed course and ended this policy, but there is no doubt that this has had lasting psychological effects on these children, some of whom remain separated from their parents. I joined Senator Dianne Feinstein as an original co-sponsor of the Keep Families Together Act, to stop the Trump Administration from needlessly separating immigrant children from their families at the border ever again. As a member of the House Armed Services Committee (HASC) I also led a bipartisan effort to ensure that service members who have permanent resident status are aware of the opportunity for expedited naturalization. With intensified military operations in recent years, many service members were not made aware of their expedited naturalization opportunities. This amendment now requires that the military provide this information to our eligible service members and veterans. 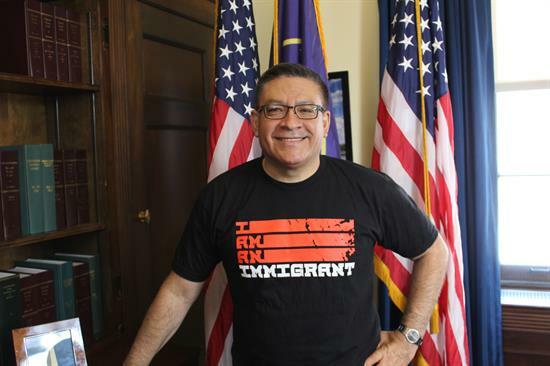 I believe immigrants have long contributed to the strength and vibrancy of America. The only way forward in solving our immigration crisis is through comprehensive immigration reform, not through xenophobic and misguided policies that dehumanize our immigrant populations. I will continue to work toward enacting sensible, bipartisan immigration reform.